I had no idea how much of a learning curve there was in starting a food blog. What’s the big deal? 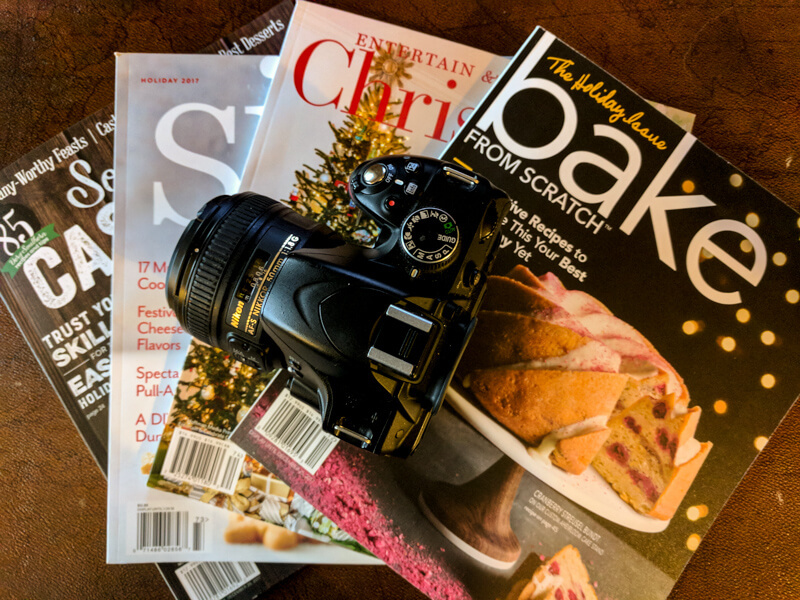 Bake some cookies, throw them on a plate, pull out my camera and write a little post. Well, sounds nice and easy, but for me (maybe not anybody else out there in the food blogging universe) “nice and easy” was the farthest thing from the truth. I think I should have a degree in “Everything Technical & Digital.” I do love it though! Life sometimes feels like a scramble to get to the next thing on the list. Recently I’ve been trying to shake myself out of the temptation to always hustle, always trying to make something happen. Learning to relax is a chore that I’ve never done very well, it takes a different kind of discipline which I am not as much accustomed to. 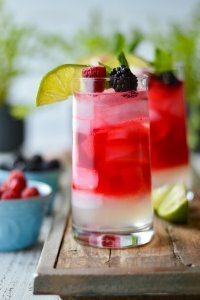 I’m never gonna be one of those that sit on my front porch drinking lemonade until the sun sets in my future. But if I’m really honest with myself, I could be a little better about relaxing, taking it easy and enjoying life at a slower pace sometimes. Which reminds me of one of my favorite things in life, opening the mailbox and pulling out the latest edition of Saveur, House and Home, Food and Wine or any other number of food magazines. It’s one way that I unwind after a long day of cooking, photographing and blogging. I grab a glass of wine, cuddle up in some comfy pj’s (well actually I’ve been wearing them all day) and get thoroughly lost in those pages. 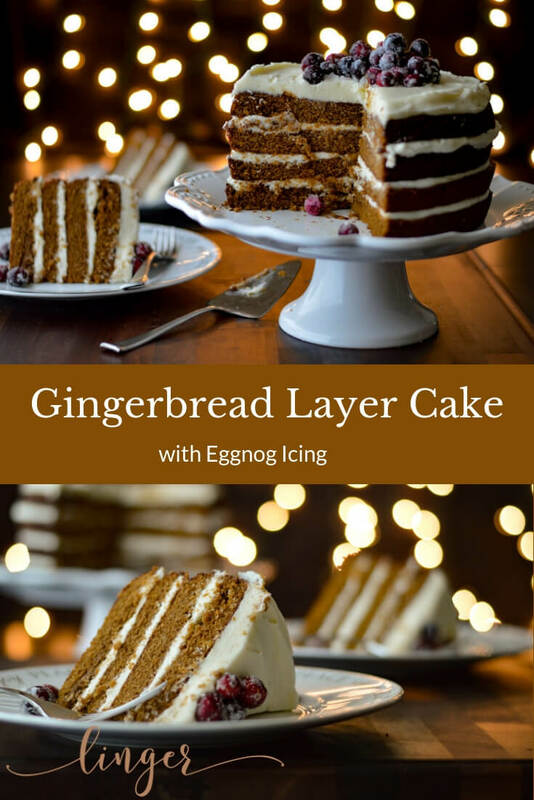 That’s how I found this lovely Gingerbread Layer Cake with Eggnog Icing recipe. Just thumbin’ through House and Home one evening as my tummy was grumbling. There it was, this enticing photo that found me scrambling through my cabinets for a jar of molasses and Guinness, extra stout (not to drink) so I could whip this delicious mess up. Here’s a handy tip. Don’t look through food magazines while hungry. It’s as bad as going to the grocery store in that same condition. Not a good idea. It’s easy to get intimidated by cakes that have layers. But let’s dismantle that misconception. The truth is they’re actually quite easy to bake and assemble. I use a large lazy Susan to turn each cake as I cut horizontally. I doubled the original recipe because it didn’t make near enough for how thick I like my layers. I had a little extra batter to make a few cupcakes as well. The frosting is what makes this cake so yummy. It’s called Eggnog Icing because you use rum extract instead of vanilla along with some freshly grated nutmeg. 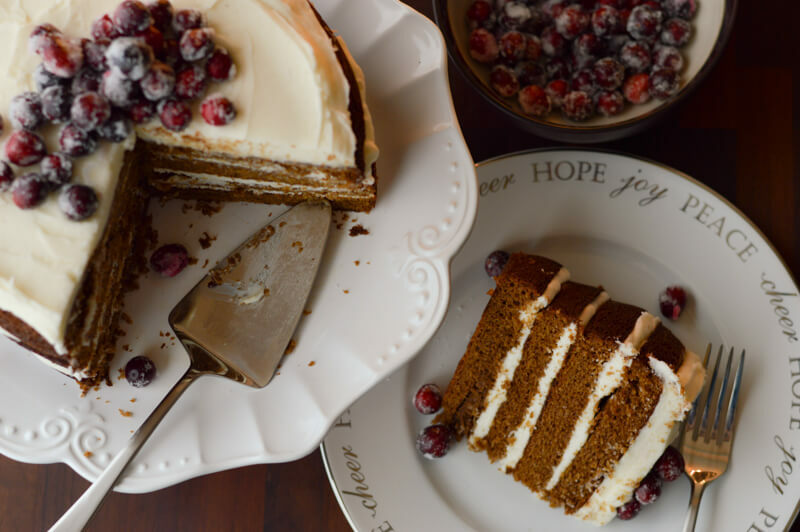 The flavors compliment the gingerbread perfectly. I broke down and bought an icing spatula this year. I’ve always just used a butter knife. It is amazing when you have the right tool in your hand. The other thing I invested in was a pastry bag with some tips (why did I wait so long? it was all of $7 or so). You can get a really nice finish when you use a large round tip to outline the edges of each layer then fill in the middle with more icing. 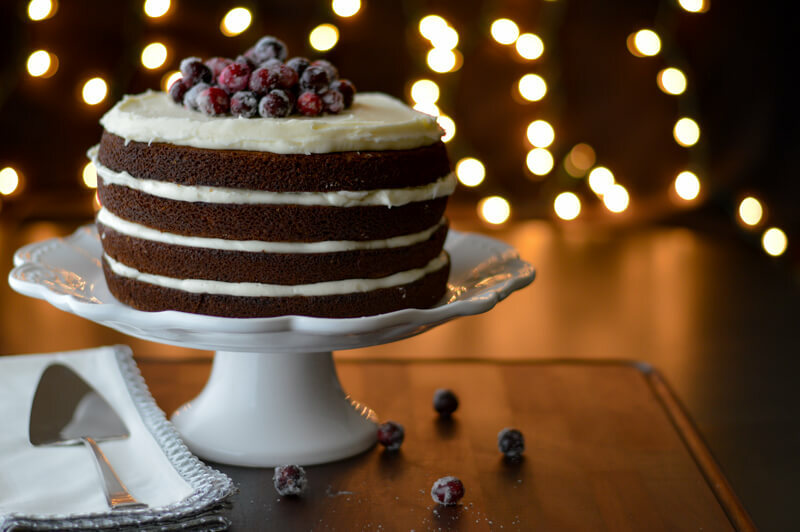 I love the festive look of this Gingerbread Layer Cake with Eggnog Icing when you garnish it with sugared cranberries. It is exactly what your Christmas table needs to add some Holiday cheer. 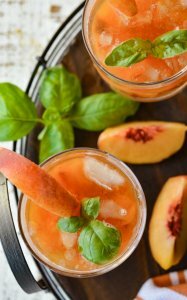 I found this recipe in a 2014 edition of “House and Home”. 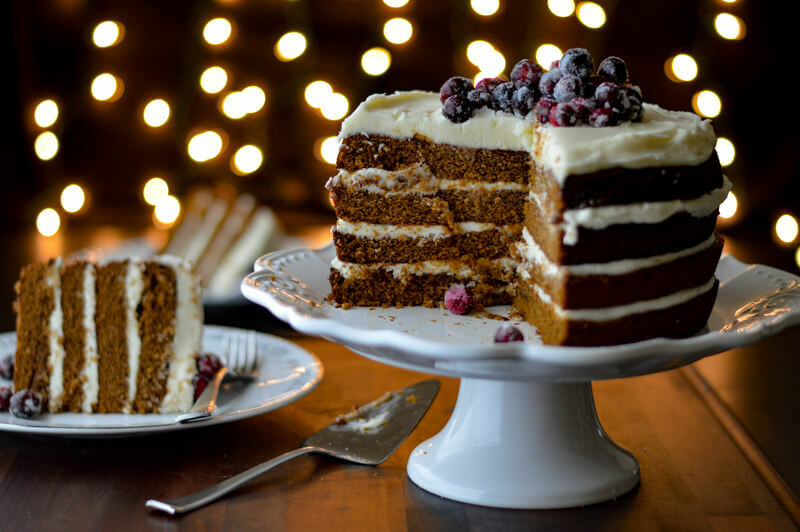 The spices perfectly combine to give this cake a wonderful holiday flavor. You cannot top it with a better frosting than rum cream cheese icing. It will be a beautiful display on your Holiday table. Whisk the stout beer and molasses in a medium saucepan and bring to a boil. Remove from heat and whisk in the baking soda one teaspoon at a time. The liquid will foam up. 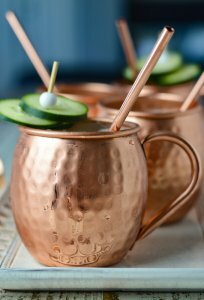 Set aside and cool to room temperature. Preheat oven to 375° F. Grease two 8 inch round cake pans and line the bottom of each pan with parchment paper. In a large mixing bowl, whisk together the flour, baking powder, spices. In a medium bowl, combine the eggs, sugars, and oil and whisk until smooth. Whisk in the stout mixture. Gradually whisk the wet mixture into the dry to form a smooth batter. Pour the batter into prepared pans to 3/4 the way full. Bake on the middle rack of the oven for about 40-45 minutes or until a toothpick inserted int the center comes out clean. Remove from oven. Set aside for 10 minutes and turn over onto wire racks. Let them cool completely. Using a hand mixer, beat the butter and cream cheese until combined. Add 2 cups of powdered sugar at a time until smooth. Add the rum extract and nutmeg while continuing to beat the icing. Using a serrated knife, slice each cake horizontally making 4 layers total. Spread 1/4 of the icing on the base layer and continue with cake layer and icing until all are stack on each other. 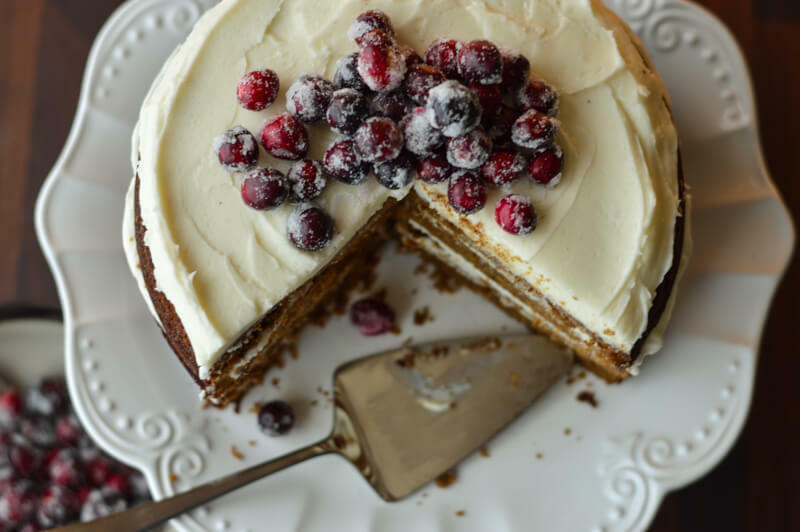 Garnish with the sugared cranberries on top of the cake right before serving. I used extra stout beer. Between that and the molasses, the cake came out a darker brown but the flavor was wonderful. I used fresh cranberries for the garnish on top of the cake. Rinse about a cup of cranberries with water through a strainer and add them to a bowl of white sugar and coat well. Lay them out in a single layer to dry for at least one hour. This will be tried this Christmas Break!! ❤️ Love love love eggnog anything!! Thank you for your comment, Theresa. You have to let me know what you think after you make it. I agree about loving eggnog “anything.” Enjoy your Christmas Break! 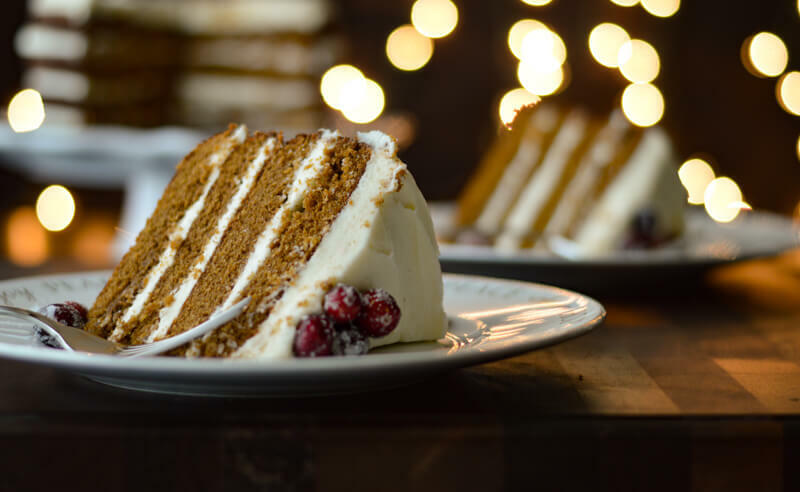 It doesn’t get any better than this gingerbread cake. And eggnog icing is to die for!